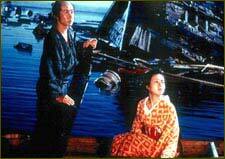 The Sea Is Watching - A Japanese Film By Akiro Kurosawa is an event that took place on 18-Oct-2006 in Hyderabad. The Kurosawa festival in town continues, and tonite, he takes you into a brothel. It wouldn't show too much class to make a few base sounds, and so we'll refrain. The Hyderabad Film Club, as part of the ongoing retrospective on Japanese Director Akira Kurosawa from 14th to 18th October, is screening The Sea Is Watching, on 18th October at the Sarathi Studios. The Sea Is Watching opens with a gentle tracking shot, gliding down from the sky into the hectic streets of a red-light district in 19th-century Okabasho, Japan. The film is a straightforward narrative, an Akira Kurosawa story, and a story about stories - how they affect people who tell and hear them. It initiates not only an empathetic relationship between the viewer and the characters, but also a relationship with storytelling itself. O-Shin, who has joined the brothel because her family is sick, keeps falling for the well-spoken customers. Early in the film, during a storm, a samurai named Fusanosuke materializes at the brothel's doorstep. He was caught in a drunken brawl and is escaping from the local police. Having found a safe harbor of sorts while he attempts to return to the good graces of his father - he has been ostracized from the family for the disgrace he has caused - Fusanosuke proceeds to visit O-Shin over the next few weeks, revealing "deeply poetic" feelings from his young heart. O-Shin falls in love with him, and Fusanosuke, for his part, feeds the flames of love by implying that the two might achieve mutual redemption. But when he finally shows up, Fusanosuke is no longer in disgrace. Rather, he's newly wrapped in arrogance. But the story continues, and another, puny looking traveler, Ryosuke, a few notches lower in social class than his predecessor, enters the brothel. Seeing the process start up again, O-Shin is warned by her friends to come to her mercenary senses about getting emotionally involved with the clientele. But O-Shin follows her heart once more and dedicates herself to teaching the hot-tempered, downtrodden Ryosuke something about the meaning and fulfillments in life, setting up the film's message of triumph over weakness and adversity. The movie ends with a furious typhoon battering the red light district, destroying all the brothels on the street and sending most of the working girls fleeing for their lives. In the storm's wake, the sea rises to levels never seen before. O-Shin and Kikuno choose to ride out the flood until they're on the roof of their establishment looking death in the face. With Akira Kurosawa's death in 1998, the world lost one of the greatest filmmakers of all time. Kurosawa was acclaimed as an original and great filmmaker during his lifetime, nationally and internationally. His films received a number of prestigious awards at home and abroad. He had directed 30 feature films. Please contact Bh S S Prakash Reddy of the Hyderabad Film Club at 2373-0841/93910-20243 for further details. Be the first to comment on The Sea Is Watching - A Japanese Film By Akiro Kurosawa! Just use the simple form below. fullhyd.com has 700,000+ monthly visits. Tell Hyderabad what you feel about The Sea Is Watching - A Japanese Film By Akiro Kurosawa!